Looking for a sweet little gift your baby will LOVE? 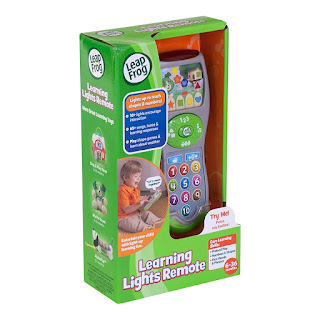 This LeapFrog Scout's Learning Lights Remote is JUST $10.99 (Retail $12.99). •Tune in to discover shapes &amp; numbers! Find learning fun on every channel as little ones explore 65+ songs, tunes and audio responses with Scout. Includes 3AAA batteries. Works well and long with Polaroid Batteries. •Keep little ones entertained in a big way with a pretend-play remote that introduces numbers, shapes and first words! Bright colors and 10+ lights encourage babies and toddlers to explore. •Press the weather button to hear how Scout finds fun in every kind of weather. Press a number, then count lights with Scout. Help Scout find shapes in his garden. •Press the music button to hear a Counting Song, Numbers Song and fun tunes. Learned skills include first words &amp; phrases, numbers, pretend play, and shapes. •Scout's Learning Lights Remote was desgined so babies and toddlers can imitate what they see their parents doing. Through this imitative play, the toy introduces early concepts around numbers and shapes as children exercise their fine motor skills.